Jacob Dahlgren and Antti Laitinen take part in HEIMAT The 2018 Guang’an Art Biennale in China. The exhibition area is located out in the open and includes exhibits at the Baozhen, a traditional residential complex, Duanjia Yard and its surrounding pools. In his installation Grid Garden, Antti Laitinen plays with the elements of two and three-dimensionality. 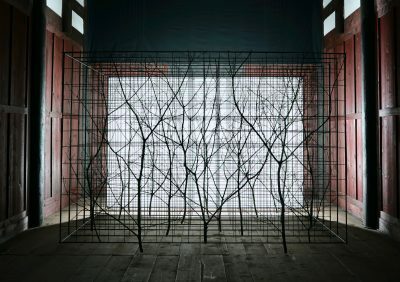 Branches gathered from the local environment are curved and attached to metal netting, forced on a two-dimensional surface. The sheets of branches form a multi-layered, silhouette-like thicket of branches. Jacob Dahlgren exhibits an interactive installation titled The Wonderful World of Abstraction. Stepping in to the cylinder-shaped structure filled with a sea of multicoloured satin strips causes a sense of loosing one’s direction. The biennale opened on 16 December 2018 and is on view until 10 May 2019.